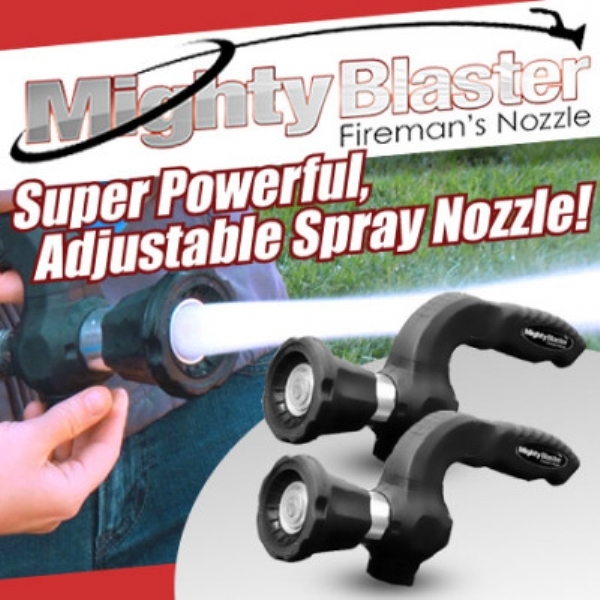 If you&apos;re tired of leaky nozzles and sprayers, the Mighty Blaster fireman&apos;s nozzle is just what you need. If you&apos;re tired of throwing away money by wasting water with leaky nozzles and sprayers, the Mighty Blaster fireman&apos;s nozzle is just what you need. Made with aircraft-grade aluminum and high-grade stainless steel, the Mighty Blaster is built to last. The lightweight, portable Mighty Blaster fits onto any garden hose and its specially-designed comfort grip reduces arm and wrist fatigue. Plus, it uses up to 40 percent less water while producing up to 50 percent more power than traditional nozzles! That means you can blast away leaves and debris from your driveway in seconds, keep your house and vehicles clean with power-spraying yet also gently water plants and flowers AND it shuts off with ease. It&apos;s the only nozzle you&apos;ll ever need! Wow it is a blaster. Makes watering so much easier. Fits my hands with very little issue. Highly recommend.